Director Rebecca Taichman, still best known for her work with modern playwrights, has quickly made a mark for herself with a series of productions at STC that have bold, striking work from the design team. Think back to that bright red, commodified world of Shrew, or the roses of Twelfth Night. Taichman has a wonderful eye, and so I looked forward to how she and her designers would guide the audience through the play's two worlds. 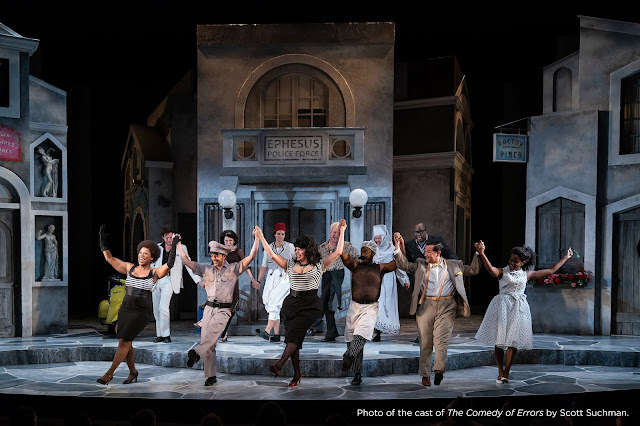 Sicilia, with the help of set designer Christine Jones, David Zinn's costumes, and Christopher Akerlind's lighting design, is a world of starkly bare walls, tailored suits, and stiff formality... or is it? Mamilius, after all, gets to hang around in his pajamas and bear-hooded robe, but even more remarkable is the state of affairs in which we meet Leontes, Hermione, and Polixenes. The men have clearly had too much to drink on the evening we meet them, and Hermione's sobriety doesn't hold back her warm affection for both men; indeed, this is the most physically affectionate royal trio I've ever seen. Between their copious embracing and the disheveled ties on the men, I sat up a little straighter in my seat. 'Ah- that's it. That's how this terrible night begins.' And indeed, that tiny clue was spot on as Leontes suddenly twisted into cruelty and began his headlong rush into jealousy. Hannah Yelland as Hermione, Mark Harelik as Leontes and Sean Arbuckle as Polixenes in the Shakespeare Theatre Company’s production ofThe Winter’s Tale, directed by Rebecca Taichman. Photo by T. Charles Erickson. That energy is actually quite necessary, and Mark Harelik's Leontes never lets up. Given too much time, we might imagine that Leontes' suspicions could relent, but if the forward motion is never allowed to slack, we reach Hermione's trial without the chance to scrutinize and ruin the mood. The early polish of the court is destroyed entirely by the time Hermione reenters in her tattered prison shift, and Hannah Yelland's righteousness gives her the authority that Harelik's Leontes has squandered in the foolishness of his actions. Incidentally, I can't let this paragraph go by without remarking on the theatrical power couple of Paulina and Antigonus, played here by Nancy Robinette and Ted van Griethuysen. These two are just as fabulous in their roles as you're hoping right now that they'll be. By contrast, Bohemia isn't a world that we witness fall apart- instead, it's a world that rises up from the ashes of Sicilia. If the large butterflies manipulated by the cast are a bit too spot-on for my tastes, I can't deny their immediate charm. Sicilia also has green fields, sheep, and an explosion of color in the costumes. Heather Wood's slow transformation from Mamilius into Perdita via Time's speech lets us savor that shift into warmth from darkness, from winter into spring. Bohemia gives us our first opportunity to let the actors show off, really, as most are doubling in new roles. The madness of Leontes becomes the riot of Autolycus. Antigonus, who sacrifices his own life to save the infant Perdita becomes the Old Shepherd who raises her. And yes, I'm a sucker for Tom Story in a comic role, so it's a treat to see him as the Young Shepherd in Bohemia rather than as a minor lord in Sicilia. This is the best bear I've ever seen, and I have SEEN some bears. Why, you may ask, is this particular ursinal appearance my favorite? Because it's the very first time I've seen it used as the actual moment of transition between the two worlds. If you don't want to be spoiled for the effect- stop here and rest easy in the assurance that you'll see something good. If you're curious, read on. As Antigonus is shipwrecked on the shores of Bohemia, his life is in peril. We'll find out shortly that all the sailors who accompanied him have perished in the storm. He is alone with an infant he is ill-equipped to take care of- and indeed, his duty lies in abandoning her to the elements and living in banishment, far from his wife and his country. It's a dark moment, one filled with fear and dread enough- but then in flickering lights and with a terrible growl, the bear appears. Y'all, I will say it outright- that bear scared the BEEJEEZUS out of me when he lumbered onstage, into that shadowed doorway. He's creepy, alright? This is a bear that will $^#* your @(&# up, ok? This is a bear that is going to EAT SOMEONE and I'm very glad it's not going to be me. And then, oh gentle readers, AND THEN. When the bear appears again in the NEXT doorway, he's running on two legs and it is HILARIOUS. It just is! It's the goofiest image we've seen all night! And the audience laughs! And that's how you do it. THAT's how you bring us from the fear of Sicilia into the joy of Bohemia. You do it with the BEAR. My hat's off to you, Rebecca Taichman, because that was masterfully done. Yet again, if you don't want to know, don't read. I won't say too much, but this may actually be the first time I've seen this moment played as pure magic. I've seen productions that make it clear Paulina has orchestrated this moment to reveal a never-dead Hermione. I've seen productions that want to have it both ways (and admittedly, the text seems to want it both ways), but we end up with something that's neither here nor there and suffers because of it. Taichman's take is that the transformation is pure magic- a statue comes to life. In this moment, artifice is stripped away entirely and the bare walls of the stage are finally revealed, and all are bathed in a gentle light that promises something wonderful to replace them. It's a gorgeous moment, to be sure, and Hermione's gradual awakening is fascinating to watch (watch for what prompts her to truly awake). This is a stylish production, but more than that- this is a beautifully felt production. Brent Carver's Camillo has enough heart to break your own, even in the midst of Sicilia's horror. There are plenty of beautiful moments thanks to the work of the design team, but there are also moments that depend entirely on the skills of this cast, and they do not disappoint. (Also, there is the world's unhappiest accordion player, and he is my Secret Favorite, shhh, don't tell him, it'll just make him hate life even more) I highly recommend this production- a sad tale may be for winter (and yes, this particular May might have us shivering more than normal), but this one's for summer.